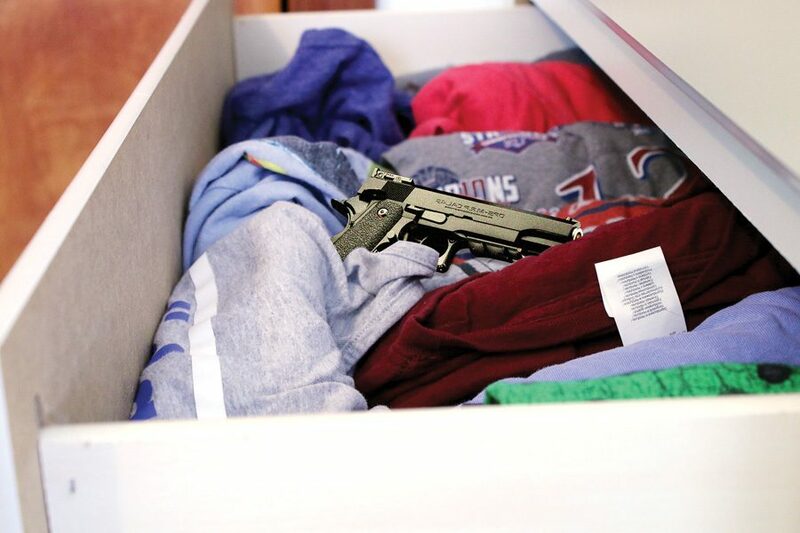 About 4.6 million American children and minors live a home with at least one loaded and unlocked firearm, according to the Giffords Law Center. Three guns brought to LHS this school year came from home. Each of the three times that guns made their way to Lawrence High this year, students found those guns at home. Those incidents — twice in February and another in the fall — have pointed to the issue of the easy accessibility of weapons and the culture around guns. According to the Giffords Law Center, about 4.6 million American children and minors are living in homes with at least one loaded and unlocked firearm. Police said both of the guns brought to LHS in February were loaded. One, which was found in a student’s backpack, had a round in the chamber. The group Be SMART emphasizes the importance of keeping firearms out of reach to prevent accidents. Be SMART presented at the Community Conversation held at LHS in the wake of the most recent incidents. Boatright encouraged parents to ask other parents about guns in the home just as they might inquire about curfews or alcohol. One message was clear from the community meeting: Parents and teachers say safety risks, such as firearms and social pressures, require more regular and in-depth discussion. Junior Cobin Retter is in regular contact with guns, but said it hasn’t changed his outlook. Sophomore Giovanni Ventello says theses incidents may stem from students’ belief in the need for self-protection. “I believe most of the incidents in which students brought weapons to school were in hopes of defending themselves against other students with weapons,” Ventello said. Retter has a different take. “I guess I would disagree with a lot people that having more guns causes more gun-related incidents,” Retter said. Ventello said recent incidents have made him worried about going to school. Sophomore Erin Doyle also experienced apprehension. Ventello’s discomfort is matched by frustration at the slow pace of gun reform in America. His cousins live in Sandy Hook, Connecticut, where 26 elementary school students and staff members were killed by a gunman in 2012. His family members lived only few miles away. “It’s like after all of these events, nothing has been done,” Ventello said.